Name Variation Joseph Schollmeyer was also known as Joe. Joseph Schollmeyer was born on 24 February 1914 at Wisconsin. He was the son of William Schollmeyer and Martha Vondra. Joseph Schollmeyer died in April 1977 at age 63. Paul Schollmeyer was the son of William Schollmeyer and Martha Vondra. Paul Schollmeyer died before July 2007. Married Name 21 October 1930 As of 21 October 1930,her married name was Nihles. Dorothy Schollmeyer was born on 5 March 1910 at Wisconsin. She was the daughter of William Schollmeyer and Martha Vondra. Dorothy Schollmeyer married Raymond N. Nihles on 21 October 1930. Dorothy Schollmeyer died on 2 June 2004 at age 94 Dorothy C. Nihles, age 94, of Lancaster, died on Tuesday, June 2, 2004, at her home. She was born on March 5, 1910, in Grant County, the daughter of William and Martha (Vondra) Schollmeyer. On Oct. 21, 1930, she was united in marriage to Raymond N. Nihles at Holy Ghost Catholic Church in Dickeyville. Together they farmed for many years in the south Lancaster area. In 1974, they retired and moved to Lancaster. She was a devoted member of St. Clement Catholic Church in Lancaster. Dorothy put a great deal of hard work into gardening, her flowers, her yard, and canning. She enjoyed her grandchildren, playing cards and crocheting. She will be dearly missed by family and friends. Surviving are two sons, Robert N. (Dolores) Nihles, Platteville, and Merlyn (Mary) Nihles, Mineral Point; two daughters, Kathleen (Gerald) Koeller, Potosi, and Judy (Stanley) Henry, Platteville; a daughter-in-law, Gwen Nihles, Lancaster; 24 grandchildren; 39 great-grandchildren; four great-great-grandchildren; a sister, Margaret Bierman, Prairie du Chien; a brother, Paul (Maria) Schollmeyer, Dubuque, Iowa; and a sister-in-law, Margie Schollmeyer, Cuba City. She was preceded in death by her husband, Raymond, on Aug. 24, 1987; a son, Vernon; her parents; three grandchildren, Steven, Sharon and Randy Nihles; five brothers, Charles, Irvin, Joseph, Bernard and Vernon Schollmeyer; and her sister, Marie Wallenhorst. Funeral services will be held on Friday, June 4, 2004, at 10:30 a.m. at ST. CLEMENT CATHOLIC CHURCH in Lancaster, with Monsignor Daniel Ganshert officiating. Burial will be in St. Clement Cemetery, Lancaster. Visitation will be held on Thursday, June 3, 2004, from 4 p.m. until 8 p.m. at the SCHWARTZ FUNERAL HOME in Lancaster, where a 4 p.m. parish Scripture service will be held. Raymond N. Nihles married Dorothy Schollmeyer, daughter of William Schollmeyer and Martha Vondra, on 21 October 1930. 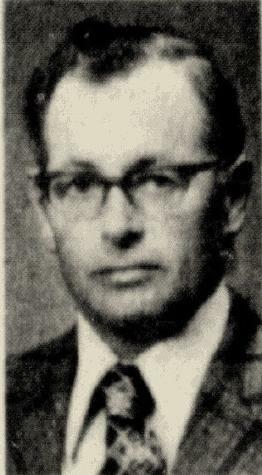 Raymond N. Nihles died on 24 August 1987. Married Name Her married name was Wallenhorst. Marie Schollmeyer was born circa 1913 at Wisconsin. Marie Schollmeyer died on 24 July 1966. Robert N. Nihles was the son of Raymond N. Nihles and Dorothy Schollmeyer. Robert N. Nihles died before 2016. Married Name 16 November 1949 As of 16 November 1949,her married name was Koeller. Kathleen Nihles was born on 16 February 1931. She was the daughter of Raymond N. Nihles and Dorothy Schollmeyer. Kathleen Nihles married Gerald C. Koeller on 16 November 1949. Kathleen Nihles died on 9 May 2016 at age 85 Kathleen M. Koeller, age 85, of Potosi, passed away on Monday, May 09, 2016, at Orchard Manor Nursing Home, Lancaster surrounded by her loving family. She was born on February 16, 1931, the daughter of Raymond and Dorothy (Schollmeyer) Nihles. On November 16, 1949, Kathleen was united in marriage to Gerald C. Koeller at St. Clement Catholic Church in Lancaster. Together, they operated the family farm just outside of Potosi for more than 50 years. Kathleen's passion in life was being a wife and mother, a true matriarch. She was a loving caregiver to her family, realizing their successes were her successes. No one ever left the house without hearing the phrase, ''come back again'' trailing them out the door as she always had a ''not-so-secret stash'' of ice cream treats waiting for them to return. In this life Kathleen was a lot to a lot of people. She was a daughter, older sister, devoted wife, giving mother, loving grandmother, friend and a life-long neighbor. She will be missed, but her legacy lives on in the many lives she has touched. Survivors include her loving husband, Gerald; their eleven children: James Koeller; JoAnn (Bill) Williams; Donna Outlaw; Barbara Weber; Vicki Laugesen; Janet (John) Reding; Marcia (Doug) Kephart; Rita (Mike) Wehinger; John Koeller; Danny (Jill) Koeller; Karen Koeller; 18 grandchildren; 25 great-grandchildren and Baby Reding on the way; her siblings: Judy (Stanley) Henry; Merlyn (Mary) Nihles; sister-in-law: Delores Nihles; nieces, nephews, and many members of the Koeller family. In addition to her parents, Kathleen was preceded in death by her brothers: Vernon (Gwen) Nihles and Robert Nihles; sons-in-law: Jerome Weber; Dennis Laugesen; and Ronald Outlaw; three nephews: Steven, Randy, and Terry Nihles; a niece, Sharon Nihles. Funeral services were held on Thursday, May 12, 2016, at 11:00 a.m. at St. Andrew Catholic Church in Tennyson with Father Richard Leffler officiating. Burial was in St. Thomas Cemetery, Potosi. Family and friends called on Wednesday, May 11, 2016, from 3:00 p.m. until 7:00 p.m. at the church and on Thursday from 10:00 a.m. until time of services at the church. In lieu of plants and flowers, a Kathleen M. Koeller Memorial Fund has been established. Martin Funeral Home & Cremation Services in Potosi is assisting the family. 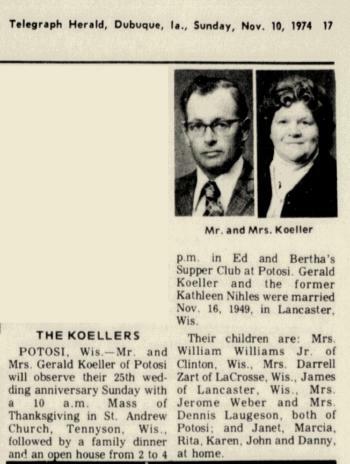 In November 1974 25th wedding anniversary of Gerald and Kathleen (Nihles) Koeller. Gerald C. Koeller was born on 8 April 1927. He married Kathleen Nihles, daughter of Raymond N. Nihles and Dorothy Schollmeyer, on 16 November 1949. Gerald C. Koeller died on 17 July 2017 at Wisconsin at age 90 Gerald C. Koeller, age 90, of Potosi, passed away peacefully on Monday, July 17, 2017, at Epione Pavilion Nursing Home in Cuba City. He was born on April 8, 1927, in the Koeller family farm house that he lived in for all of his life, the the son of Clarence and Ruby (Retallick) Koeller. On November 16, 1949, Gerald was united in marriage to Kathleen M. Nihles at St. Clement Catholic Church in Lancaster. They were married for 67 years. Gerald attended Sinners Creek, a one room school house, about three miles from his home. He then attended Lancaster High School where he graduated in 1944. Gerald was involved in FFA and served as the club's president for three years. He also worked on his family farm and had a job selling shoes. After high school, Gerald wanted to enlist in the United States Navy to serve our country. Instead, he decided to stay home and start his family. He enjoyed boxing and dancing during his high school years and young adulthood. Gerald always told people he graduated from the "College of Hard-Knocks." After graduating high school, he started his lifelong career as a farmer. Gerald worked many times from dawn until dusk. He was his own engineer designing and building his own equipment he needed in order to farm. Gerald loved horses, especially his horse, Prince. Reading was a favorite past time. He retired from farming in 1990. The stage of life that he loved most was his midlife because he got to enjoy his family. He and "Mother" enjoyed the company of their family and extended family. There was a lot of laughter on Sunday afternoons when the family gathered in the farm house. Many times, time was spent sitting around the kitchen table talking, laughing, and having a beer together. While enjoying company on a Sunday afternoon, you could expect to find Gerald and his family watching a Green Bay Packer's game. He was also active in the community. Gerald was a member of the Potosi Township Board, St. Andrew-Thomas Parish Council, AMPI Milk Board of Directors, and the Grant Electric Co-Op, now known as, Scenic Rivers Energy Co-Op Board of Directors for more than 30 years. During that time, he also served on the Dairyland Powers Board of Directors and as Chairman for five years. In March of 2001, Gerald was awarded with WECA's (Wisconsin Electric Cooperative Association) highest honor, given annually to recognize service to the rural electric program above and beyond the routine performance of duties. In June 2016, Gerald was an honored guest at the 75th anniversary of Dairyland Power, where he received recognition for his years of service and commitment that he dearly enjoyed. In addition to his parents and his wife, Gerald was preceded in death by sons-in-law: Jerome Weber; Dennis Laugesen; and Ronald Outlaw; twin sister, Geraldine (John) Skonetch; a brother, Melvin Koeller; sisters-in-law, Mary and Rosemary Koeller; three brothers-in-law, John Flesch, Vernon (Gwen), Robert Nihles; and many members of the Nihles family. A Mass of Christian Burial will be on Friday, July 21, 2017, at 11:00 a.m. at St. Andrew Catholic Church in Tennyson with Father John Meinholz officiating. Burial will be in St. Thomas Cemetery, Potosi. Family and friends may call on Thursday, July 20, 2017 from 3:00 p.m. until 7:00 p.m. at St. Andrew Catholic Church in Tennyson and on Friday from 10:00 a.m. until time of services at the church. Martin Schwartz Funeral Home & Crematory in Potosi is serving the family. Vernon Nihles was the son of Raymond N. Nihles and Dorothy Schollmeyer. Vernon Nihles married Gwen (?). Vernon Nihles died before June 2004. Married Name Her married name was Nihles. Gwen (?) married Vernon Nihles, son of Raymond N. Nihles and Dorothy Schollmeyer. Gwen (?) died before 2016. Name Variation Joseph F. Pluemer was also known as Joe. 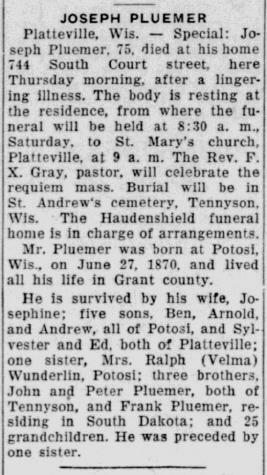 Joseph F. Pluemer was born on 27 June 1870 at Potosi, Grant, Wisconsin, also reported as Jun 1869. He was the son of Joseph J. Pluemer and (?) Stohlmeyer. Joseph F. Pluemer married Josephine M. Langmeier circa 1899. Joseph F. Pluemer was buried in October 1945 at Saint Andrews Cemetery, Potosi, Grant, Wisconsin. He died in October 1945 at at home, Platteville, Grant, Wisconsin, at age 75 Joseph Pluemer, 75, obituary. [S246] U.S. Federal Census 1880 U.S. Federal Census, by Ancestry.com, NA Film Number T9-1427 Page Number 339B. [S245] U.S. Federal Census 1900 U.S. Federal Census, by Ancestry.com, ED51. Dwelling 144. Married Name circa 1899 As of circa 1899,her married name was Pluemer. Josephine M. Langmeier was born on 11 September 1880 at Wisconsin. She married Joseph F. Pluemer, son of Joseph J. Pluemer and (?) Stohlmeyer, circa 1899. Josephine M. Langmeier died on 6 April 1957 at age 76. She was buried after 6 April 1957 at Saint Andrews Cemetery, Potosi, Grant, Wisconsin. Josephine M. Langmeier had 1 with 1 living in 1900 children. She had 4 with 4 living in 1910 children. Arnold F. Pluemer was born circa 1903 at Wisconsin. He was the son of Joseph F. Pluemer and Josephine M. Langmeier. Arnold F. Pluemer married Leona C. Muller, daughter of August Muller and Kate (? ), circa 1924. Arnold F. Pluemer died before 1944. Name Variation Sylvester G. Pluemer was also known as Sylvester W.
Sylvester G. Pluemer was born circa 1907 at Wisconsin. Name Variation Edward J. Pluemer was also known as Eddie. Edward J. Pluemer was born circa 1910 at Wisconsin. Name Variation Andrew J. Pluemer was also known as Andy. Andrew J. Pluemer was born on 12 March 1912 at Wisconsin. Andrew J. Pluemer died in October 1977 at age 65. Andrew J. Pluemer obtained US Social Security Card at Iowa; last residence Platteville, Grant, Wisconsin. 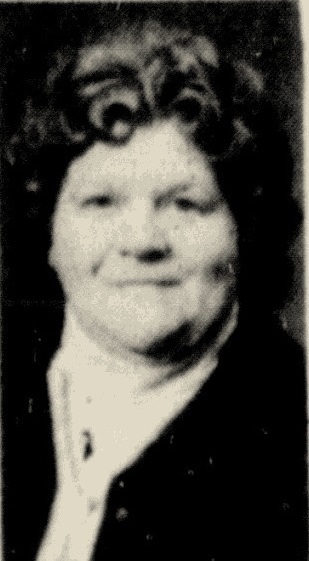 Name Variation Velma M. Pluemer was also known as Valma. Married Name before 1945 As of before 1945,her married name was Wunderlin. Velma M. Pluemer was born circa 1915 at Wisconsin. She was the daughter of Joseph F. Pluemer and Josephine M. Langmeier. Velma M. Pluemer married Ralph D. Wunderlin, son of Francis I. Wunderlin and Maude C. Horner, before 1945. Joseph J. Pluemer was born in May 1833 at Prussia. He married (?) Stohlmeyer, daughter of John Stohlmeyer and Mary A. Fecht, before 1867. Joseph J. Pluemer married Agnes (?) circa 1874. Joseph J. Pluemer died after June 1905. [S245] U.S. Federal Census 1900 U.S. Federal Census, by Ancestry.com, ED51. Dwelling 198. Married Name circa 1874 As of circa 1874,her married name was Pluemer. Agnes (?) was born in April 1847 at Wisconsin. She married Joseph J. Pluemer circa 1874. Agnes (?) died on 12 August 1900 at Grant, Wisconsin, at age 53. Agnes (?) had 4 with 2 living in 1900 children. Frank Pluemer was born circa 1874 at Wisconsin. He was the son of Joseph J. Pluemer and Agnes (?). Frank Pluemer died after 1945. Name Variation Elisabeth M. Pluemer was also known as Elizabeth. Name Variation Elisabeth M. Pluemer was also known as Lizzie. Married Name 7 November 1893 As of 7 November 1893,her married name was Strohmeyer. 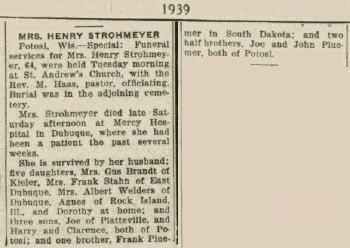 Married Name 7 November 1893 As of 7 November 1893,her married name was Stohlmeyer. Elisabeth M. Pluemer was born in February 1875 at Wisconsin. She was the daughter of Joseph J. Pluemer and Agnes (?). Elisabeth M. Pluemer married Henry F. Stohlmeyer, son of John Stohlmeyer and Mary A. Fecht, on 7 November 1893 at Grant, Wisconsin. Elisabeth M. Pluemer died in February 1939 at Dubuque, Iowa, Elizabeth (Pluemer) Strohmeyer (Stohlmeyer) obituary. Elisabeth M. Pluemer had 3 with 3 living in 1900 children. [S245] U.S. Federal Census 1900 U.S. Federal Census, by Ancestry.com, ED51. Dwelling 171. Peter H. Pluemer married Pauline (?). Peter H. Pluemer was born in November 1871 at Wisconsin. Peter H. Pluemer died after 1945. [S246] U.S. Federal Census 1880 U.S. Federal Census, by Ancestry.com, NA Film Number T9-1427 Page Number 354C. [S245] U.S. Federal Census 1900 U.S. Federal Census, by Ancestry.com, ED51. Dwelling 145. Name Variation Clotilda Uppena was also known as Unppena. Name Variation Clotilda Uppena was also known as Clotilde. Married Name 6 July 1920 As of 6 July 1920,her married name was Pluemer. Clotilda Uppena was born in June 1889 at Wisconsin. 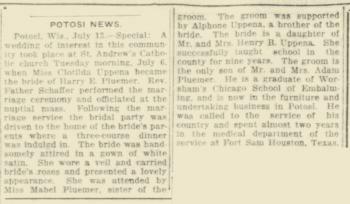 Clotilda Uppena married Henry E. Pluemer, son of Adam Pluemer and Elizabeth S. Rupp, on 6 July 1920 Harry E Pluemer and Clotilda Uppena marriage announcement. Clotilda Uppena was buried in January 1961 at Saint Andrews Cemetery, Potosi, Grant, Wisconsin. She died in January 1961 at age 71 Mrs Harry Pluemer (Clotida Uppena) obituary. Name Variation Henry B. Uppena was also known as Unppena. Henry B. Uppena was born in November 1852 at Wisconsin. He married Katherina A. Neiner circa 1883. Henry B. Uppena died after 1925. Name Variation Katherina A. Neiner was also known as Kate. Married Name circa 1883 As of circa 1883,her married name was Unppena. Married Name circa 1883 As of circa 1883,her married name was Uppena. Katherina A. Neiner was born circa 1856 at Wisconsin. She married Henry B. Uppena circa 1883. Katherina A. Neiner died after 1925. Katherina A. Neiner had 9 with 8 living in 1900 children. John J. Kahle was born circa 1896 at Wisconsin. He was the son of Theodore Kahle and Louisa Lange. John J. Kahle married Viola C. Pluemer, daughter of William Pluemer and Anna Rebecca Mechler, before 1925. Theodore Kahle was born in 1870 at Wisconsin. He married Louisa Lange, daughter of John Lange and Elizabeth Jansen, in 1892 at Wisconsin. Theodore Kahle died in 1941. Married Name 1892 As of 1892,her married name was Kahle. Louisa Lange was born in 1873 at Wisconsin. Louisa Lange married Theodore Kahle in 1892 at Wisconsin. Louisa Lange died in 1962. Name Variation Wilhelmina Ames was also known as Minnie. Name Variation Wilhelmina Ames was also known as Mina. Married Name 22 January 1878 As of 22 January 1878,her married name was Pluemer. Wilhelmina Ames was born in June 1858 at Wisconsin. She was the daughter of Nicholas Ames and Christina M. Scholl. Wilhelmina Ames married Frank Joseph Pluemer, son of Frank Pluemer and Barbary Zeng, on 22 January 1878 at Grant, Wisconsin. Wilhelmina Ames died after 1925. Wilhelmina Ames had 5 with 5 living in 1900 children. [S245] U.S. Federal Census 1900 U.S. Federal Census, by Ancestry.com, ED51. Dwelling 101. Name Variation Peter Harry Pluemer was also known as Harry. Peter Harry Pluemer was born in May 1880 at Wisconsin. He was the son of Frank Joseph Pluemer and Wilhelmina Ames.